Supaflex, in the latter half of 2010 had and interesting enquiry for rubber bellows IE to replace the entirety in the Liver Building (all 52 up to 200mm NB tied units). 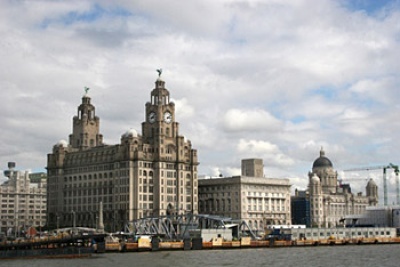 This is the HQ home, since it was built in 1911, of The Royal Liverpool Insurance Company. RLI had suffered big problems with total failure bursts flooding parts of the building. The offending units were EPDM Nylon reinforced on LPHW pumps and equipment. A brand produced in Germany, but their failure was no fault of the original German manufacturer. Whilst the EPDM goes brittle with age on LPHW so does the nylon reinforcing. The FM contractor at the time had not taken this into account with disastrous and costly consequences. With a new FM contractor on board we advised them to go for Kevlar reinforced units. Kevlar has now superseded steel mesh reinforcing technology. With age you just get small signs of leaks, not a total burst. The Interflex Group of which Supaflex Pipeline equipment is a division has a wide range of rubber bellows solutions. Two options of Kevlar reinforced are available the Trelleborg range type HP - L1 tied with isolators in the tie bars and the Mason Safelex (see the case study on this). The Trelleborg units were chosen for the project as they closely fitted the installed lengths of the existing. We wish RLI another 100 years in their building, maybe the bellows will have to be changed once or twice more, but no floods!